What is causing this poor performance in productivity? And how do we solve this problem? For several years the British economy has performed admirably in creating jobs, promoting business investment & innovation, maintaining high levels of consumer demand and growth. And all the while keeping inflation relatively low by historic standards. However there is one glaring issue in which the economy has consistently underperformed, for what seems like an eternity. Yes, you’ve guessed it, it’s the P word… productivity. And despite the Government’s best efforts over many years, there is absolutely no sign from recent figures that there is any discernible improvement. Towards the end of 2016, productivity per hour in the UK grew by a mere 0.4 per cent, according to the Office for National Statistics - a concerning result given how much emphasis is placed on productivity for both the health of the economy and modern organisations. So what is causing this poor performance in productivity? And how do we solve this problem? A major study of IT leaders and business users we recently published provides some interesting insights and some possible answers. Our study examined how organisations are failing to manage data and data related tasks efficiently, thereby causing huge productivity pains for businesses and employees alike. In our first report into the financial impact of disconnected data, we found that data silos and a lack of collaboration were causing disconnected data across companies, costing organisations billions. This is having a huge impact on productivity, and compounding this problem is the sheer number of applications workers are using on a regular basis. On average, respondents are using seven different business applications or systems on a regular basis, with IT decision makers using, on average, eight applications. The problem is these different apps and systems are too often not linked together, inevitably leading to delays in accessing information and difficulties in connecting disparate data sets together for informed decision-making. Clearly a worker who needs multiple systems and applications to do their job, but does not have a single point of data access or a simple view across all systems, is going to take more time to perform tasks and deliver desired outputs. The importance of different systems working together is clear from the widespread use of multiple apps and systems in daily work life. However, when this doesn’t happen, it’s leaving employees wasting time on boring and repetitive tasks – such as data entry, searching for data, accessing archived data and data processing and analysis. But boring and repetitive tasks are a fact of life for most organisations. So if highly-skilled staff don’t perform them, then who does? There is a simple answer to this. Most of these tasks can be automated. We have the technology available now to complete such undertakings. Spending time on these activities, which could be easily automated, is a huge drain on business time. 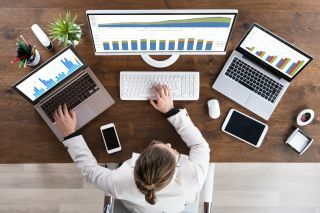 In fact, respondents are spending, on average, 32 minutes a day moving data from one system to another, equating to 19 working days per year per employee. Aside from the time saving benefits of automation, there is also the reduction in the chances of human error or differences in interpretation or classification of data. In many organisations, especially the larger ones, it’s possible for instance that employees from different departments could be entering the same data but into different systems. This leaves the data itself open to interpretation by different individuals, classified in a different way or in some cases missing all together. Our research shows that almost two-thirds (64 per cent) of respondents agreed that data gaps in their organisation are holding back their ability to be more productive. Take the sales and marketing teams for instance. Marketers working closely with the sales team often need to engage with existing and new customers during a campaign. This could be either to promote a new product or service, or offer a special seasonal discount on an existing product line. If the customer or prospect contact details they are using are incomplete, or erroneous, then valuable time is wasted. Either the contact doesn’t receive the information about the product or discount in the first place, or the data needs to be cleaned before the campaign can start. So what is the answer to this data headache? When it comes to disconnected data and the problems it causes, the most common request people have in response is a demand for more and better connections. However this is easier said than done. It takes a serious investment of time and effort to harmonise data and make sure it is connected throughout an organisation. But whilst 87 per cent of respondents in our survey noted that their organisation had encountered challenges when trying to unite company data, they know giving up is not an option. Most (91 per cent) of those who use multiple apps or systems see connecting data, applications and systems as a beneficial thing for their organisation to do. The benefits include the ability to act on more accurate and up to date information, better collaboration between colleagues and ultimately improved morale as staff spend less time on menial, unproductive tasks. With the proliferation of big data set to rise inexorably over the next few years, IT leaders need to seize the day and make sure they get a handle on data. With data increasingly being seen as a business asset, those organisations that make their data asset sweat the most are likely to be the one that improve their relationship with customers to drive sales and ultimately gain market share.